Marketing with quality articles, podcasts, videos and more - our slides for PowerPoint provide important information about content marketing. Content marketing is one of the most popular online marketing vehicles aside from e-mail marketing and the placement of advertising banners. Companies don’t advertise in the traditional sense, but in the spread of interesting blog articles, tutorials or infographics about issues that directly or indirectly affect them. Prospective customers automatically arrive at the content provider’s website or easily come in contact with its services and products. Aggressive promotional activities are being criticized more and more by many customers today. Through creative content marketing, alternative routes can be taken: with well-researched and beautiful, graphical content, you can create value for your customers and draw their attention to your deals. 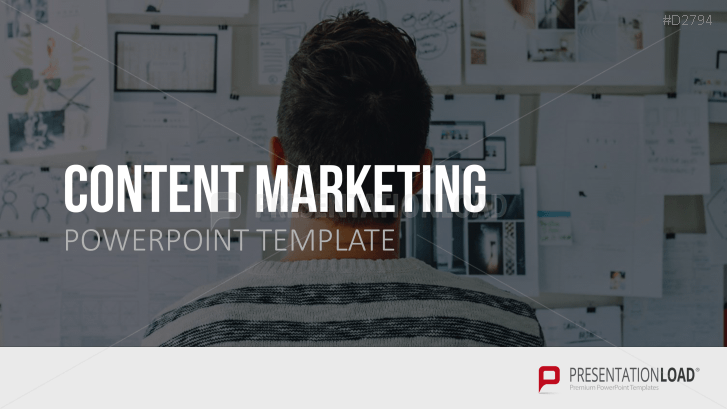 Our Template for PowerPoint puts together important information about content marketing in vivid graphs. You can find representations of different content formats and possible channels as well as information on how to plan and implement your content marketing concept.